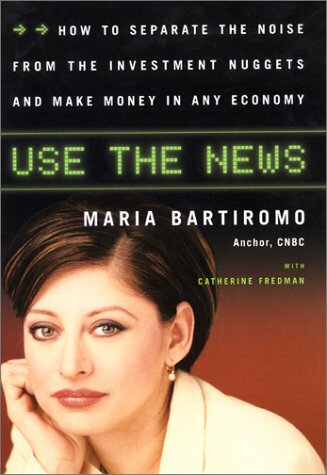 In her highly anticipated new book, television's ace financial reporter CNBC anchorwoman Maria Bartiromo shows you how to use timely news and hot information to make money in today's market. A media luminary with the solid credentials of a seasoned pro, Maria Bartiromo has set the standard for business news programming, delivering indispensable, up-to-the-minute information from the New York Stock Exchange. Known for her spot on calls, her straightforward on-air manner, and her willingness to ask tough questions, she is probably the most famous and visible business news correspondent in the business media today and one of the top five most influential voices on Wall Street. Maria was the first person to report live from the floor of the New York Stock Exchange and continues to do so every day on CNBC's SQUAWK BOX. In Use The News, Maria Bartiromo mines her years of frontline experience, on camera and behind the scenes, to identify all the tools you need to seize control of your financial decisions and better manage your portfolio. How to tell which company announcements are important and which are simply fluff. Where you can find hidden gems of investment information. How to get the lowdown on a company's CEO and management team. How to use the Internet to find useful information amid all of the clutter. How the government can affect your investment decisions. When to trust market professionals -- and when to ignore them. What really matters on a company's balance sheet. Which red flags mean trouble in different industry sectors. Every day, to bring the latest news and stock picks to her viewers, Maria relies on the expertise of the sharpest people on Wall Street. She is one of the most connected financial journalists working today -- making her Rolodex a virtual who's who of financial wizards. In Use The News she has picked the brains of the best and the brightest and brings their secrets to you, the individual investor. As a result, you'll get exceptional tips from some of the most influential people on Wall Street, the same people whom Maria relies on every day to help her handicap the market. The result is an indispensable investment handbook where you, too, can learn the secrets of the Wall Street insiders, take control of your investments, and make money in any economy. Maria Bartiromo a former producer, writer, and editor of CNN Business News, now hosts and coproduces her own show on CNBC, Market Week with Maria Bartiromo. She also anchors CNBC's Street Signs and Market Wrap on a daily basis. She is a contributing news commentator to NBC's Today Show, MSNBC, and other NBC affiliates nationwide. Her popular monthly column can be found in Individual Investor magazine. A graduate of New York University, she lives in New York City with her husband, Jonathan Steinberg, founder and chief executive officer of Individual Investor Group.